In preparing a module on health literacy for a physician audience, I had the opportunity to review some papers on principles of patient-centered care. 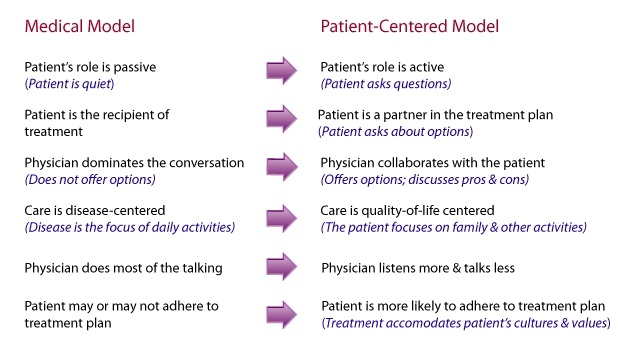 Patient-centered care is based on the idea that patients are active participants in developing a health strategy for themselves. This means that both physicians and patients have responsibilities in communicating information and concerns. This video by Don Berwick (also a physician) is a great introduction to why patient-centered care should be the core of healthcare provider-patient interactions. I want to be sure I explained everything clearly. Can you please explain it back to me so I can be sure I did? What will you tell your wife (husband/partner/child/etc) about the changes we made to your medications today? We’ve gone over a lot of information today about how you might change your diet. In your own words, please review what we talked about. How will you make it work at home? The teach-back method should be practiced in chunks, checking each time new information is presented. Here the doctor takes time to be a learner rather than a teacher, to find out whether his or her communications have been effective. For doctors who find the directive of “slowing down” in opposition to the reality of a 15-17 minute office visit, it’s worth considering the potential practice benefits of patient-centered care. 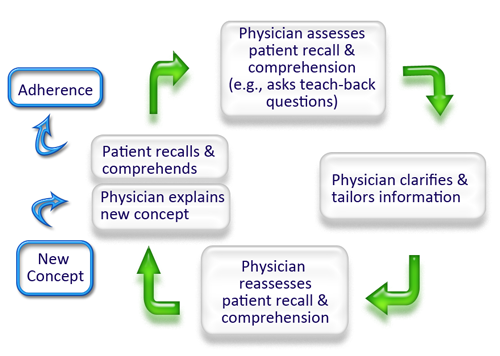 In probing questions of health literacy and physician-patient communications, it’s tempting to cast patients always in the role of recipients of information, but as we’ve seen from the patient-centered care model and findings from using the teach-back model, this role should be rethought. Certainly, as patients (regardless of our level of expertise), we all have much to learn. We are not experts in medical science; yet we are certainly experts in our experiences and our personal values. We are experts in what matters to us and in the circumstances that will cause us to embrace one treatment strategy/lifestyle change and reject another. These are issues which we must teach our physicians, even as we learn from them. Eastaugh, S.R. (2004). Reducing litigation costs through better patient communication. Physician Executive, 30(3),36-38.
practice: impact on current wellbeing and future disease risk. British Medical Journal, 317(7167), 1202-1208. Schillinger, D., Piette, J., Grumbach, K., Wang, F., Wilson, C., Daher, C., Leong-Grotz, K., Castro, C., & Bindman, A. (2003). Closing the loop: physician communication with diabetic patients who have low health literacy. Archives Internal Medicine, 163 (1), 83-90. Stewart MA. (1995). Effective physician-patient communication and health outcomes: a review. Canadian Medical Association Journal, 152(9),1423-1433. Weiss, B.D. (2007). Health literacy and patient safety: help patients understand. A Manual for Clinicians, 2nd ed. Chicago, IL: American Medical Association Foundation and American Medical Association.